Every year we ensure our grass mixtures consist of the highest performing varieties available, all selected from the current RGCL. Our seeds are routinely tested for germination and purity, ensuring top performance and full traceability. We know every farm is different so we can mix an order to suit your requirements and production needs Just call us, its no trouble. Bulky Westerwolds provides high yields over a short time. Extremely fast establishment and growth, predominantly used for one year silage production. Can produce valuable winter grazing, or an early spring bite followed by a leafy cut, depending on production needs. For optimium spring growth drill in early autumn and graze off before winter to improve hardiness. Contains highly digestible tetraploid and high yielding Italian Ryegrass to put more silage in the clamp with close heading dates to make this mixture easy to manage. Establishes rapidly for early and late utilisation, providing the optimum balance between high quality and yield. 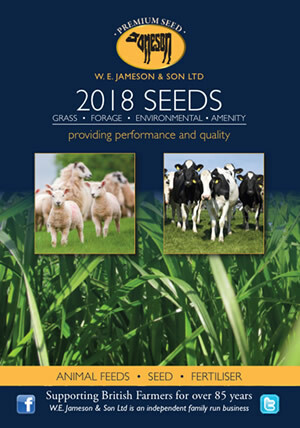 A perfect option for prolific spring grass growth and a very large first cut in May, or can be sown late autumn due to its ability to establish at lower temperatures. Hybrids provide improved leafiness in 2nd and subsequent cuts. Up to four cuts in one season in a silage only situation. Responds really well to nitrogen inputs. Alamo provides the best ground cover for an Italian. High yielding mixture, incorporating red clover, producing high protein forage. Hybrids are the best grasses available for intense production, high yielding, very quick to establish and naturally produce high water soluble carbohydrates. The combination of hybrids and red clover provides a premium quality ley for 3 years. Can also be fed with maize and whole crop silage. Excellent for fattening lambs on the aftermath. AstonCrusader provides excellent early spring growth with good disease resistance. Provides good early spring growth for early cutting. AberWolf provides excellent annual yield combined with an outstanding mid-season D-value. Tetraploids increase WSC which aids silage fermentation and aftermath grazing. Hybrid ryegrass produces high yields of silage and intermediate ryegrass for quality aftermath grazing. Available with the option of white or red clover to increase protein content and improve intake. Early heading varieties in this mixture will provide quality grazing throughout the season with the option to close up for a late first cut in mid-summer. This ley gives a very dense and highly productive sward with great persistence. Hybrid ryegrass provides better ground cover and improves yield in second and third years. Silage mixture for intensive situations where nitrogen use is high and Timothy and white clover are therefore unsuitable. A combination of some of the best varieties on the Recommended List gives excellent long term growth. A thick bottomed sward to also provide maximum grazing yield. The two tetraploids, provide good yields and improves midseason D-value. An excellent dual purpose ley suitable for cattle or sheep. Timothy is an ideal choice for colder and more exposed sites. Diploids are developed to suit wetter growing conditions and produce a dense sward. This mixture supports good ground cover and is long lasting. Clover assists in the palatability and density of the sward, improving livestock performance. Combines the benefits of intermediate and late perennial ryegrass varieties. The wide range of ryegrass heading dates in this mixture ensures maximum yield and digestibility. This sward will be persistent and very dense for many years. If closed up for cutting the ley will provide a bulky mid season silage yield. Inclusion of tetraploid grasses will increase palatability therefore improving intake by livestock and will provide good drought resistance. Heavy, wet soil means the ground is easily poached and can prevent machinery access. In such conditions it is important to select species which suit heavier/wetter soils, and often long term mixtures are preferred where regular ploughing is impractical. No. 9 is very leafy producing a lush, dense sward with excellent persistency. A thick sward density enables it to withstand more wear. The later ryegrass varieties are more hardy whilst white clover will fix nitrogen. If a sward is damaged and becomes open, it allows weeds and unsown species to invade. Overseeding will quickly check this and maintain productivity by increasing both yield and quality. A simple but effective way to rejuvenate damaged, or old grass leys, without the cost of a complete reseed. No.10 can also be used in poached gateways and worn areas, where ringfeeders have been sited, to bring areas back into full production. The large seeded and vigorous strains of tetraploid ryegrass establish quickly and are more able to out compete weed grasses.